London has now overtaken Paris as Europe’s dining capital. More than 150 new restaurants open in the city each year and the food served at those restaurants influences dining trends around the world. Along with the Brits, millions of international travellers passing through London are exposed to London’s leading-edge cuisine. In 2013 alone, around 180,000 Chinese visited London, spending on luxury goods and dining at the latest and greatest restaurants. The U.K. capital is also a popular destination for big spenders from the Middle East. These travellers return home inspired by what they have seen and consumed. 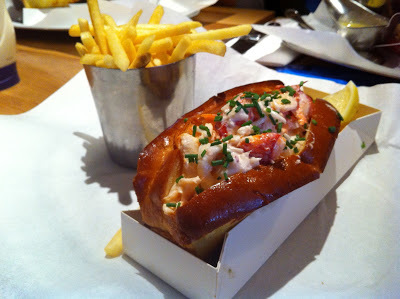 London’s global and cultural influence is just one reason I am both excited and slightly worried about the recent rise in the popularity of lobster, lobster rolls in particular, in the city. When I moved to London for business in 2005, I was interested to see how lobster was perceived and consumed within this vast city. I come from a four- generation lobster fishing family and spent much of my youth working as a sternman on my father’s boat. The industry is in my blood and, while I am no longer of that world, I remain deeply interested in how lobstermen’s hard-earned catches are regarded and sold in urban environments. I quickly learned that up to 80% of lobster consumed in the U.K. comes from Canada (England simply can’t meet consumer demand from its depleted stocks of Cornish lobster). Most of that lobster passes through Billingsgate Fish Market before being sold to high-end London restaurants. All of this changed in 2011 with the opening of a restaurant called Burger and Lobster. The restaurant, owned by Russian entrepreneur Mikhail Zelman, has completely changed the lobster scene in London. Zelman brought lobster to the masses through a simple restaurant concept. His restaurant serves only two items – burgers and lobsters – at one set price of £20 (approximately $34 USD). London diners loved it. While not cheap, the price of Zelman’s lobster (served grilled or as a lobster roll) was about half that of most other restaurants. The restaurant’s set price of £20 no matter what was ordered made lobster feel more affordable and accessible. It was no longer the most expensive item on the menu. In fact, it was the same price as a hamburger. A very expensive hamburger, yes, but context influences perception and in that context lobster felt like a bargain.